Cutest look and find book for kids EVER! – A family focused message. – More than 1,500 hours of artwork. – The first in a series of 10 books. People who liked the old look and find books will love this one! 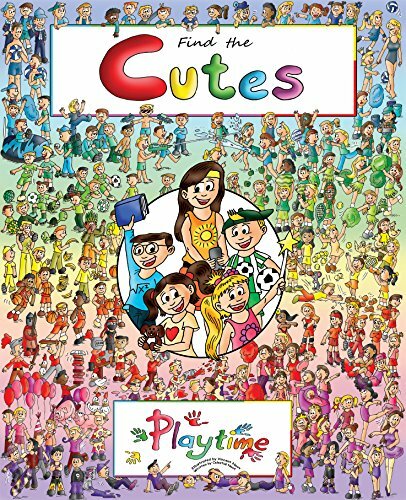 “Find the Cutes – Playtime” is a look and find book for girls, but it is also a look and find book for boys. Seek and find books are fun for road trips, to get your children away from the TV, to sit down with them and read, for waiting rooms at a clinic, in church, child day care centers, etc. The details are well-polished, cute, and beautiful. It’s a lot of fun! The book is about a family with their last name being “Cute.” There are 5 kids to look for. The oldest daughter has to babysit her siblings but keeps texting her friends to much, so you’re going to help her find them! Sounds like fun? Order it now, and the author and illustrator will sign it!